The welding jacket. Even for the skilled welder, this piece of your equipment arsenal is ultimately and often the only thing standing between you and a very serious injury. You don’t want an injury, you want the very best welding jackets possible. Needless to say, this is a piece of equipment that you are going to want to spend a lot of time mulling over. After all, there are lots of options out there and while they all promise to be safe secure and worth your time and money, that simply can’t be true of all of them, right? Right. 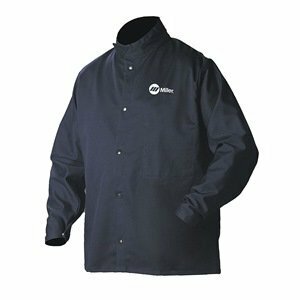 Buying the best welding jacket possible is crucial to your safety and to your ultimate welding experience, but making sure that everything goes smoothly is going to take time. If you are like most people, time probably is something that you do not have to spare. That is why we did it for you. We did the research, we committed to the testing, and we found the best options on the market. Read on for a guide to the best welding jacket reviews. We will start with the very best of the best—our choice for the top welding jacket on this list. The first thing that we are going to talk about is the material—which is really the most important component when discussing the welding jacket anyway. As one might assume, the Miller Electric Pigskin jacket is made of pig skin leather. When it comes to welding jackets leather is a really great material because not only is it durable enough to stand up against the sparks and flames that go flying during the welding process, but it also keeps you at a comfortable temperature as you do your work. Durability is the definitely the biggest selling point of this unit but it also worth mentioning that it has convenient features, like a plethora of pockets, and it’s also available at a reasonable rate. Best of all there really aren’t any setbacks associated with this jacket. It does its job of protecting you well, and it does it at an affordable rate. None! This jacket really does what it is meant to. Coming in second, the Lincoln Electric—a high caliber jacket with many features reminiscent of those that we had found so desirable in our number one pick. Of course, there is a reason that this premium cowhide jacket was not quite able to claim that number one spot. In the case of the Lincoln Electric the issue is basic but also very frustrating (and potentially hazardous): the tailoring. That’s right, many users have found it very difficult to order a jacket with the right measurements in terms of sleeve length, shoulder width, etc, etc. The good news is that once you do find your optimal measurements, the jacket will work well. The durable cowhide leather is going to keep you very safe and protected, while the cotton backing will keep you cool during the welding process. Like the Miller Electric, it also features a plethora of protected pockets that will prove convenient on the job. Bottom line: it’s a good jacket with a small but tricky flaw. 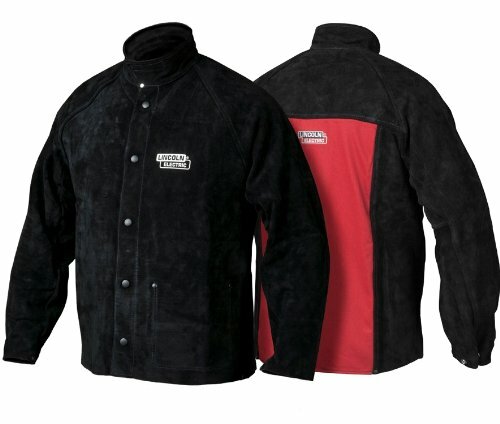 Coming in third and in our “best welding jacket for the money” slot is the Miller Electric 2241909. You’ll recognize the manufacturer as the same company that made the jacket occupying our number one slot. This model is actually a little different than that unit, and the other jackets on this list. The 2241909 is made deliberately of lighter materials making it the best welding jacket for summer use. It achieves this utility through an exclusively treated cotton design. As we all know, there is a built in con to this: cotton simply is not going to offer the same protection as leather. Bottom line? This jacket is really excellent for light welding, but not so good for heavy duty work. The good news is that given the price it is definitely affordable enough to buy as an extra jacket for when you are working jobs that don’t require comprehensive protection. 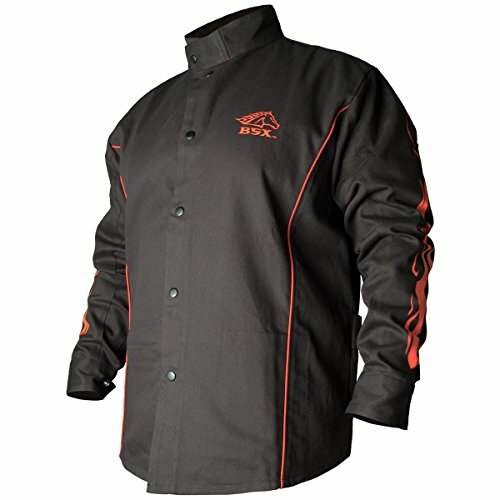 Coming in fourth, the Revco BSX welding jacket. 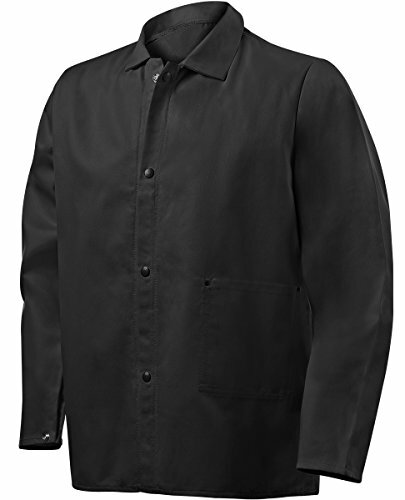 This another cotton jacket meaning it will do a pretty alight job of keeping you cool in the work shop, but it will also won’t offer you the level of protection that some welders require. To put it simply the Revco is another good jacket with reliable but limited utility. The cool fabric the inside pockets, and the thorough protection are all features that should all be great for the casual welder. Fair warning, this definitely isn’t one of those “we saved the best for last,” type situations. Before we get too negative about this unit, let’s talk about what it does right. For one thing, it’s the most affordable jacket on this list by a fairly significant margin. In fact, it’s more reasonably priced than most regular jackets (you know, the kind that aren’t made to keep you from catching on fire). If you are looking for a decent going about your day jacket this might even be something to consider. If you are looking for something that will keep you from getting burned, you might want to look elsewhere. To be clear this product isn’t guilty of any sort of false advertising or misleading customers. Its purpose is to protect you as you perform very light welding, and that is a task it will probably succeed at. The problem? The heat resistance on this unit is so sparse that if anything at all goes wrong at all you’re really vulnerable to injury. In our opinion it’s just better not to risk it, but if you feel that you must you can at least count on getting a good deal. 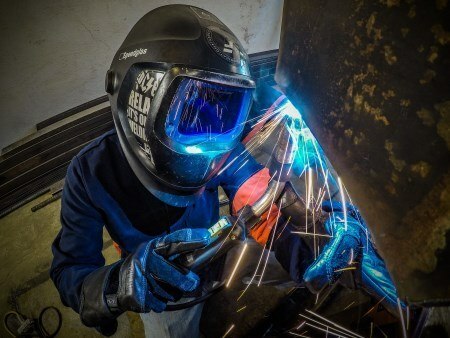 Now that you are aware of some of the awesome welding jackets out there, here are a few considerations that should help to ensure you manage to get yourself a good one. First things first the material. Of all the considerations out there, the material is probably the most important as this is the only thing standing between you and sparks and small fires that can occur throughout the process of welding. Ideally, the material of your jacket is going to both keep you comfortable and protected. But what type of material is up for handling this task? While there is more than one answer to that question conventional wisdom indicates that a blend is going to best serve your needs. Cotton, wool, leather, and denim are all suitable for handling this important task. We don’t want to sound snobby but brand does matter at least a little bit when it comes to welding jackets. There are some things (like cereal) where the difference between the brand product and its off-brand equivalent is pretty minuscule. In this scenario, the stakes are pretty low. Similarly, the difference between a brand name and an off-brand jacket might also be minimal but in this case the stakes aren’t so low. It’s really pretty simple: when talking about a product that is the only thing standing between you and a nasty burn it’s probably going to be worthwhile to spend a few extra dollars on the better product. Finally, the matter of price. As you probably noticed as you read through the reviews the lowest price does not necessarily represent the best deal and the highest price does not necessarily represent the best product. Ideally your welding jacket is going to provide a combination of quality and value. For example our best for the money pick will keep you safe and it will also keep your wallet fat. And that’s that: our take on the five best options on the market. You have read the welding jackets reviews and now you are left with a decision on your hands. Which of these products is right for you? Well, if you would like one final nudge in the right direction we did have a couple of recommendations to offer. For the person looking for the best of the best the Miller Electric Pigskin Jacket is really going to rock your world. It’s safe, secure, and about as stable an option as you can expect to get. On the other hand, if all you are looking to do is good a good deal on a safe product, look no further than the Miller Electric 2241909—our best for the money pick. Of course, these are only suggestions. Our job is not to tell you what to buy, it’s to help make the process a little bit easier for you.